The only problem with green smoothies is they are often not filling enough. Most people don’t realize that green smoothies are actually snacks, and not full meal replacements. So if you try to replace a meal with a typical green smoothie which might contain about 100-200 calories, naturally you are going to find yourself hungry within about an hour or two. Today I’m going to show you exactly how to make green smoothies more filling by adding extra healthy filling ingredients to them. To be able to make green smoothies more filling, first of all you need to know the anatomy of a complete meal replacement. Mealtimes these days have become more of a time consuming chore, rather than a pleasure. We often race through our meals to fuel our bodies and keep hunger at bay, rather than because we are enjoying the process of sitting down at the table to eat with our family and friends. We tend to just do that more on special occasions now. In fact, a 2013 study gathered by the Institute of Food Technologists in America, found that half of the adult population buy already prepared foods from convenience stores such as hot dogs, deli sandwiches, pizza and other breakfast staples which have been offered in convenient ready-to-eat packages. This just shows how busy people are that they’re now not even willing to slice their own veggies. I can’t blame them for choosing to go the easier route, since we all seem to be trying to beat the clock. I for one have fallen into this trap years ago where I could barely take a bite of my breakfast because I was constantly rushing from one task to another trying to get to work on time. Even at work I’d be so busy at lunch time that I’d bring in something unhealthy that gave me the most amount of calories in the smallest number of bites. This pattern continued until I fell ill on my honeymoon. 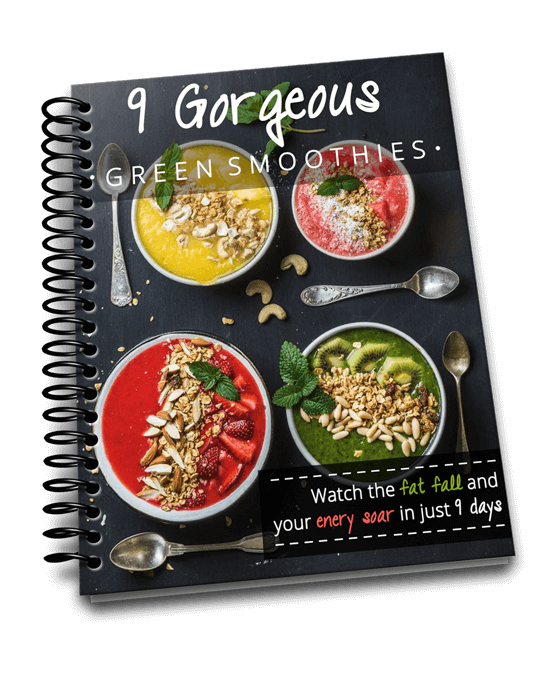 When I had the time to investigate more about what made my health suffer to that extent, I came across a brilliant idea of using healthy green smoothies to replace actual, plated meals. Not only did green smoothies bring back life to my weakened body, but it also made my tummy always full so I didn’t have any cravings for unnecessary snacking which helped me drop down 5 dress sizes. To make the whole story short, green smoothies have been the key in my diet to unlock fabulous health and overall wellness. However, not all green smoothies are created equal. 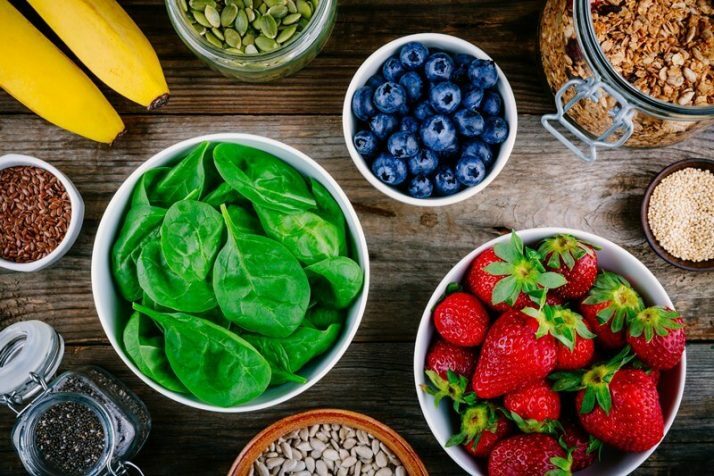 Some recipes call for fewer ingredients such as just one piece of fruit and one cup of spinach, which is only ideal as a cap-off for an actual meal. On the other hand, smoothies that have a thicker texture are more filling as they use healthy “fillers” or ingredients that are not necessarily calorie-dense but aid in improving satiety levels. I have a name for these meal replacement green smoothies to distinguish them from regular thin green smoothies. I call thick green smoothie meal replacement shakes – Green Thickies. This is also the name of my website. Today, I’m going to show you how to make green smoothies more filling so you can actually substitute them for your plated meals without feeling hunger pangs and cravings that you might have had with regular green smoothies. 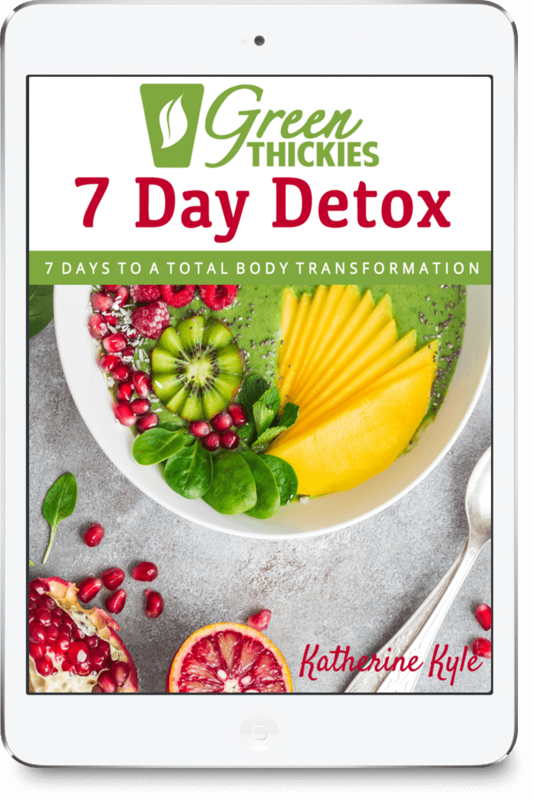 Before we get to the part where I reveal the ingredients that make green smoothies more filling, I wanted to walk you first through the important components of these health drinks so you can lay down the foundation for adding “fillers”. Basically, a green smoothie uses a healthy liquid for the base to allow the ingredients to blend and to allow you to be able to drink it. Most beginner recipes will require you to just use water. The more complete smoothie recipes, however, make use of juices and non-dairy milk. These liquids help you achieve a smooth, creamy consistency which is essential for an enjoyable drink. Except for water, any healthy liquids can even add a zing of flavor to the smoothies. If you are making your own smoothie from scratch I suggest you use 1 cup of liquid per smoothie serving. And then there’s the leafy green—the main ingredient from which the beverage got its name. The options are varied and you may even combine two kinds of greens to your smoothie to make it a whole lot healthier. Great examples of leafy greens you might choose are spinach or chard. 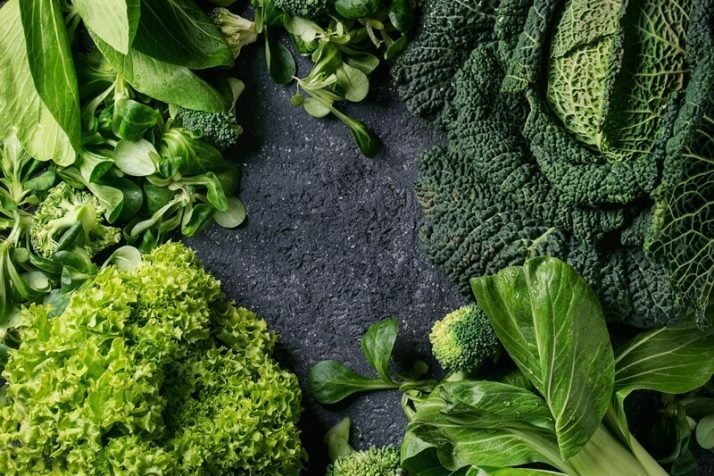 The leafy greens provide most of the nutrients which give you energy and help you feel full without adding too many extra calories. Use 1-2 cups of leafy greens per smoothie. 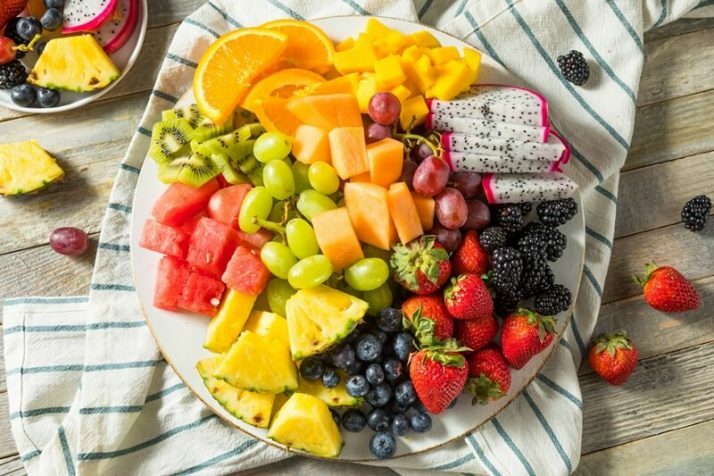 No smoothie or healthy shake is complete without the phytonutrients that come from fresh, whole fruit. The fruit provides the sweet taste and also a lot of the calories needed to fill you up and give you energy. These can camouflage the bitter flavor of the leafy greens to make drinking easier and more enjoyable. Use 1-2 cups or 1-2 small pieces of fruit per smoothie. Next on the list are the natural sweeteners in form of dried fruits and syrups that are not sourced from refined sugar. 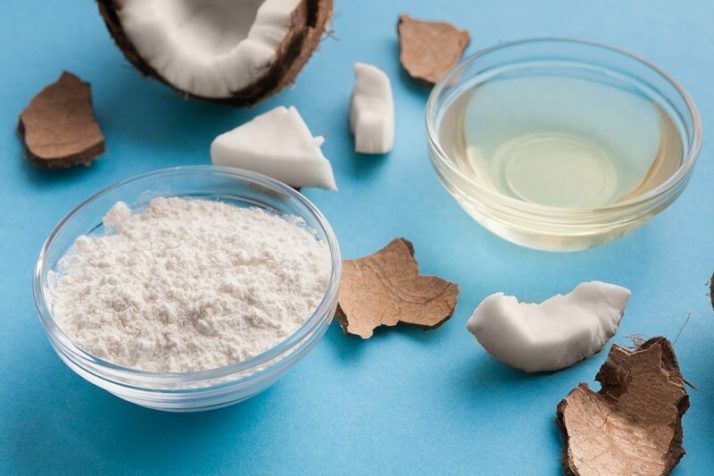 This ingredient is actually optional as some people have a sweeter tooth than others. Seeing as most people are sugar addicts and prefer their food extra sweet, I designed my Green Thickies to make it easy for people to switch unhealthy sweet food for ultra healthy equally sweet meals without noticing the difference in taste. Use 1 tablespoon of liquid sweetener or 1 date per serving of smoothie. 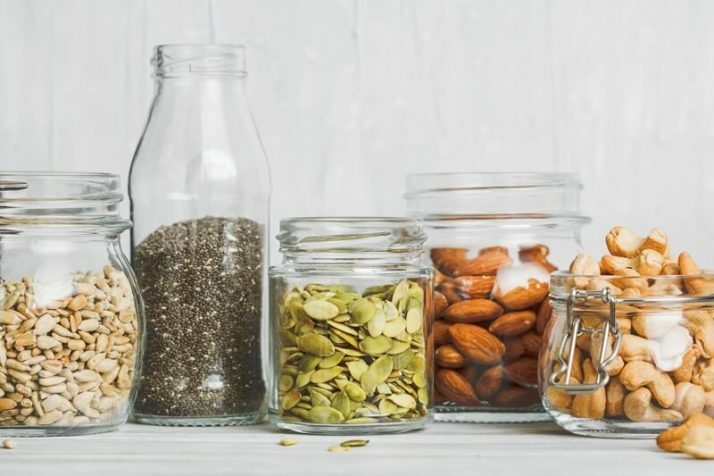 Although all plant based foods already contain a good supply of protein, I like to add ingredients that are higher in protein such as nuts, seeds or even (dare I say it) beans. These make the smoothie creamy and thick while filling you up and helping you build muscle. Use 2 tablespoons of nuts or seeds per serving, or ½ cup of cooked beans per serving of smoothie. 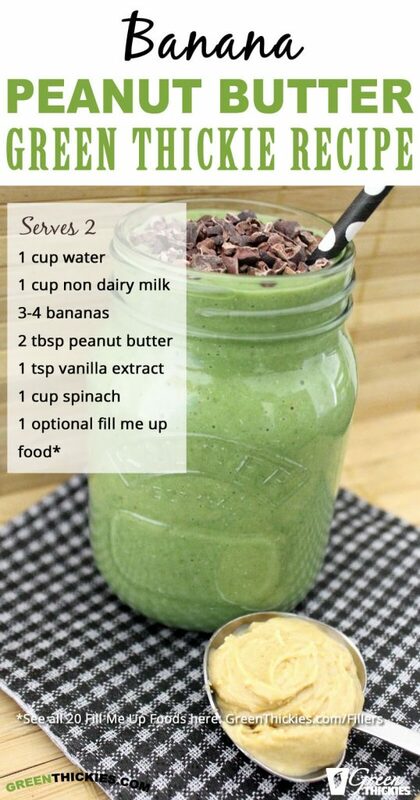 I also include “fillers” to the recipe to make green smoothies more filling. Fillers are always healthy whole foods that provide additional calories and nutrients. This is what the bulk of this post is all about. There are actually 20 different fillers that you can use to add additional calories to your green smoothies to turn it into a complete meal. All you need to do is take any smoothie recipe, add in a protein source such as 1-2 tablespoons of plain nuts and one of the fillers below. With all these ingredients combined together, you can confidently skip sit-down meals and replace them with a glass of green smoothie without the feeling that you might go hungry hours later. This will actually help you lose weight, because when you get enough calories from healthy foods, you won’t be tempted to snack on junk food. Unless a smoothie is filling enough to make you replace your sit-down meals, you are better off consuming your food the usual way. This is why I have come up with 20 ingredients that you can use as “fillers” to help increase your satiety levels so you can actually go about your daily routine without ever feeling deprived or hungry. 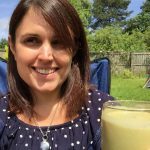 I have listed down these fillers for your reference, including fun facts that explain why they can be used as healthy add-ons for your green smoothies. I have listed the quantity of ‘filler’ that you can add to 1 serving of smoothie. Most of my Green Thickie recipes serve 2, so you would need to double the quantity if you are making a smoothie that serves 2. All of the following fillers contain around 150 calories which will go a long way to increasing the calories and nutrients in your smoothies so you can make them more filling and turn them into a complete meal. Banana has been known in the health and fitness community to be an excellent source of energy even when eaten alone. But did you know that adding them to your green smoothies will make you feel full for longer? There’s actually science behind it. 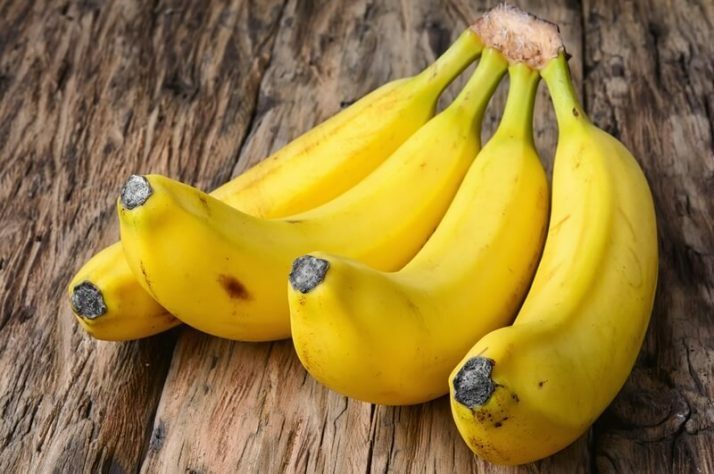 Apparently, banana contains resistant starch, which digests slowly. This results to the feeling of fullness so you can avoid overeating and unnecessary snacking in between meals. Bananas contain quite a lot of water, so adding bananas to your smoothie will increase the size of your smoothie quite considerably. 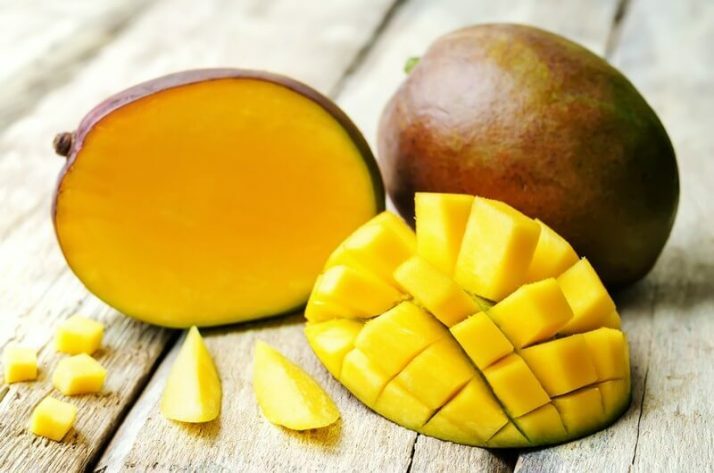 Mango is not only a nutrient-dense fruit, but also a natural sweetener that doesn’t raise your blood glucose levels. Of its 2.6 grams dietary fiber, 61% is soluble, which means it can help slown down the gastric emptying that contributes to the feeling of fullness. By improving your satiety levels, you can say goodbye to overeating which is the usual culprit in weight gain. Mangos contain quite a lot of water, so adding bananas to your smoothie will increase the size of your smoothie quite considerably. 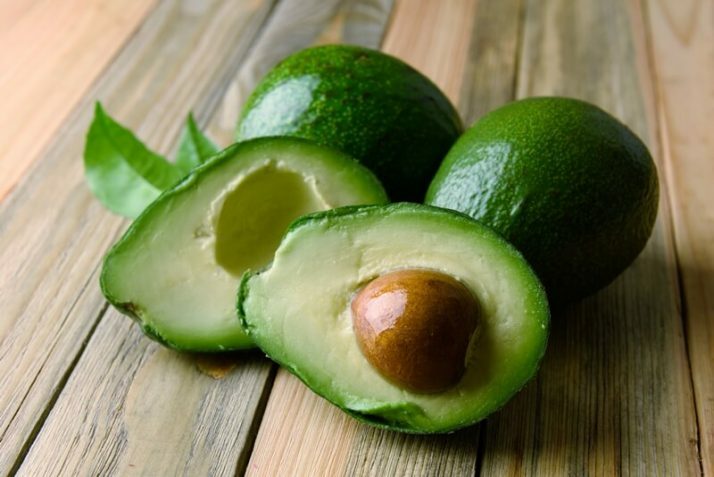 A recent study concludes that the “good” unsaturated fats and fiber in avocado helps curb your appetite, which suggests that this fruit improves your satiety levels. If you add this as filler for your green smoothie, it will not only make your drink creamier, but also give it a filling boost. This wonder food is made from ground coconut meat that retains most of its healthy fats and fiber. Because coconut is rich in MCT (medium-chain triglycerides), it helps increase satiety and reduce food intake in the long run. 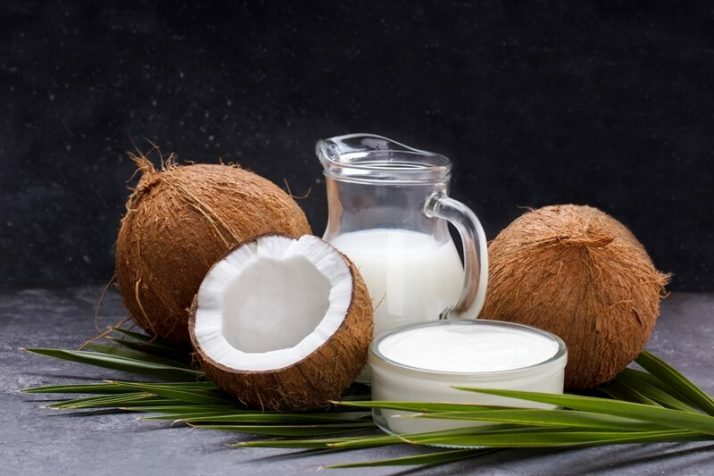 On the same note as the above mentioned coconut byproduct, coconut milk is another filler that you can use for your green smoothie having the same nutrient content and health components that contribute to the feeling of fullness. I am referring to canned coconut milk here, not coconut milk from a carton as that is too low in calories and often contains refined sugar. 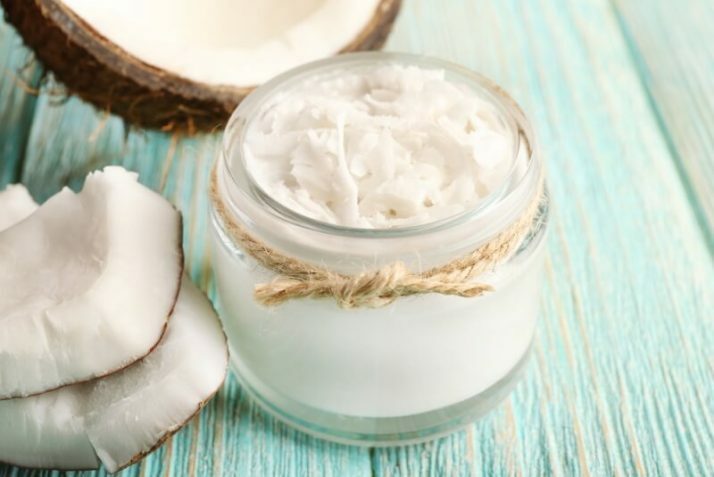 Even the canned coconut milk can contain some nasty additives that you don’t want to be consuming. So I would recommend that you make you own coconut milk using my recipe here. Another coconut derivative, coconut cream is non-dairy filler that helps vegans enjoy their green smoothies minus the guilt. 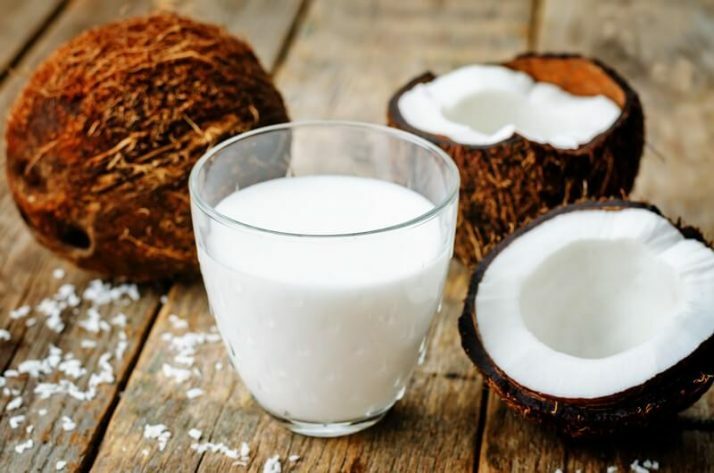 Aside from adding robust flavor to the beverage, it also helps your stomach feel fuller given its thicker consistency compared to coconut milk; although both byproducts are high in satiety-inducing nutrients. This is basically powder resulting from drying the leftovers of coconut milk production. It is a gluten-free and low-carb flavor enhancer that also delivers a filling punch to your smoothies. It is lower fat than the coconut ingredients listed above. 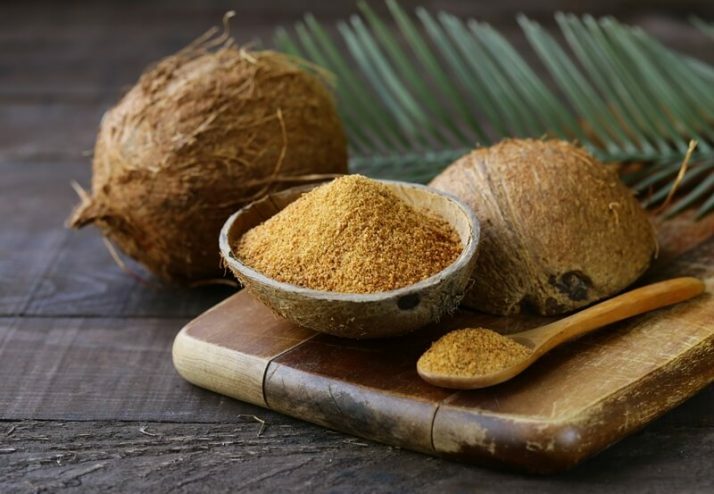 As coconut flour is quite dry and dense, you might find that your smoothie is too thick after adding this to it. If that’s the case, simply add a small amount of water until it thins out the smoothie. For my own recipes, I use almonds as either a topper or filler that is blended together with the rest of the ingredients for green smoothies. 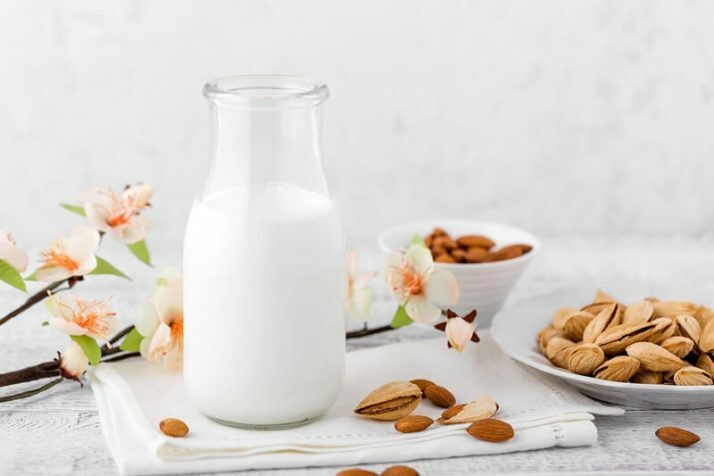 Almonds are high in protein, which a recent study suggests is more effective in keeping you full than the carbs and fats similarly present in these nuts. So instead of snacking on them alone, why not add these almonds as fillers to make green smoothies more filling? When choosing nuts you want to make sure they are not salted and not roasted as this will make your smoothie taste horrible. 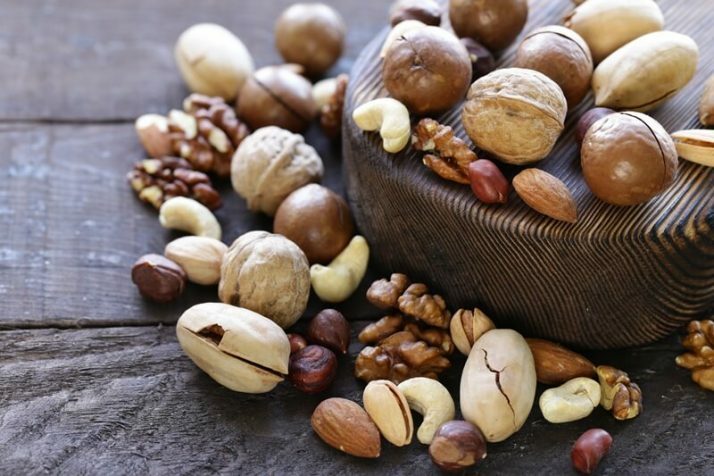 Good choices of nuts are cashews, almonds, pecans, brazil, and walnuts. My favorite nuts to add to green smoothies are pecans because they make the smoothie taste like dessert. As nuts are quite dry and dense, you might find that your smoothie is too thick after adding this to it. If that’s the case, simply add a small amount of water until it thins out the smoothie. Butters made from nuts, particularly peanuts, are popular for providing satisfaction after meals, which results to a reduction in appetite. This is according to a research conducted by Purdue University, which also states that consuming peanut butter can make you feel fuller as compared to other carbs-rich snacks. 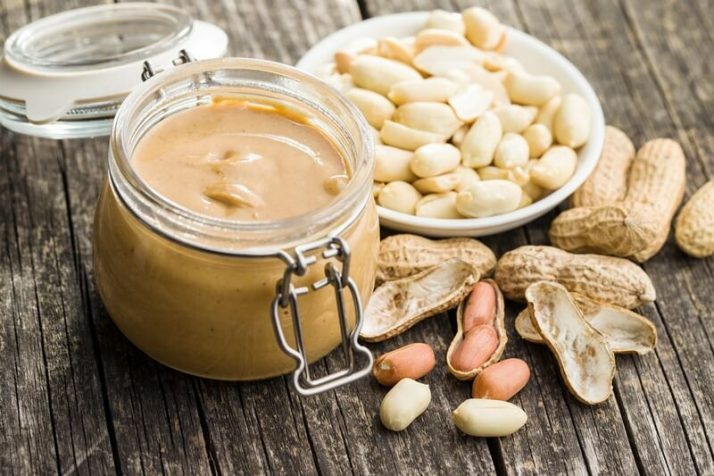 Some people consider healthier nut butters are almond butter, cashew butter or other nut butters. Nut butters can make smoothies taste creamy, rich and very delicious. Check the ingredients in your nut butters as you don’t want to use anything that contains refined salt, refined oils or other harmful processed ingredients. If you can’t find a nut butter that only contains nut and no other ingredients, you might want to try making your own. Try my easy peanut butter recipe here. Chia, flax and hemp seeds, among many others, help you achieve your ideal weight by suppressing your appetite for longer. In a randomized trial study, it revealed that adding seeds to health drinks such as yogurt and smoothies, helps a person to achieve satiety. This is all thanks to fiber, which the seeds have high amounts of. As seeds are quite dry and dense, you might find that your smoothie is too thick after adding this to it. If that’s the case, simply add a small amount of water until it thins out the smoothie. Just like nut butters, seed butter can aid in appetite suppression by making you feel full immediately after consumption. These are made by grinding seeds into a sticky texture similar to that of peanut butter. You can make butter from sunflower, sesame, pumpkin and even watermelon seeds. If you don’t wish to allocate more time into its preparation, I recommend that you purchase organically-packaged seed butter from the market. If you already love breakfast oats, you’ll find it a good filler as well for your green smoothies. These grain-based filler are bursting with fiber goodness, which is what makes you stay full for the rest of the day. When added to your green smoothies, your satiety levels can even improve, which makes you stave off hunger pangs and cravings. 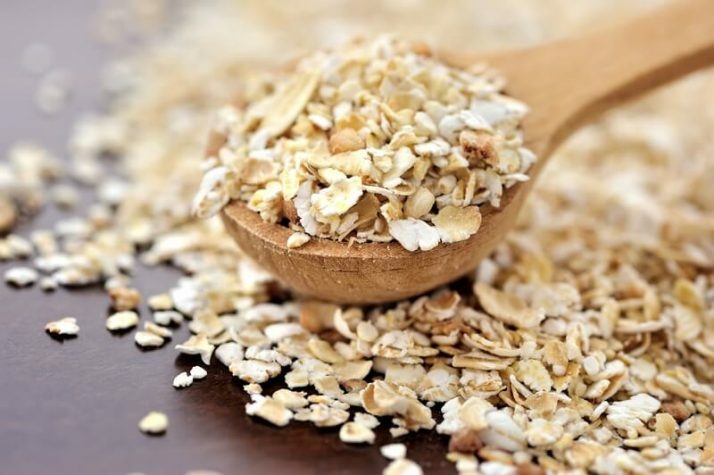 Oats are one of my favorite fillers to add to green smoothies and I used this filler for many many years before trying other fillers. Oats are super sweet and creamy which make the smoothie taste divine. Plus they are so easy to just throw into your smoothie without further preparation. As oats are quite dry and dense, you might find that your smoothie is too thick after adding this to it. If that’s the case, simply add a small amount of water until it thins out the smoothie. I’m sure you have plenty of questions when it comes to adding oats to your smoothies. 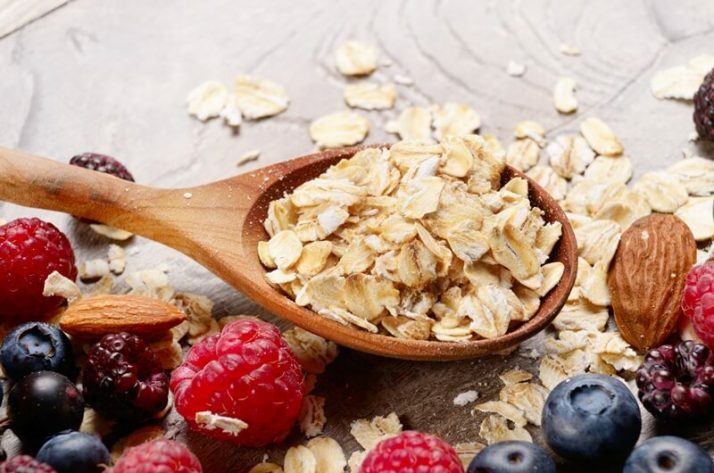 Check out my complete guide to oats which will answer all your questions when it comes to adding oats to your smoothies. 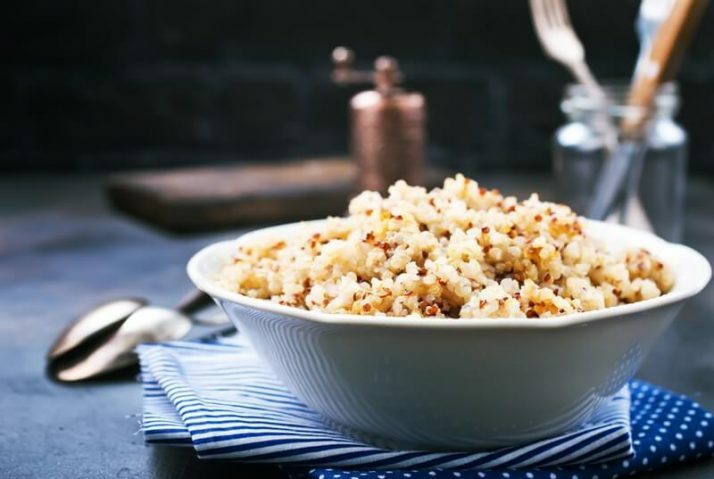 Another grain superfood, quinoa is rich in lysine, which is an amino acid not only responsible for tissue growth, but also in inducing satiety. 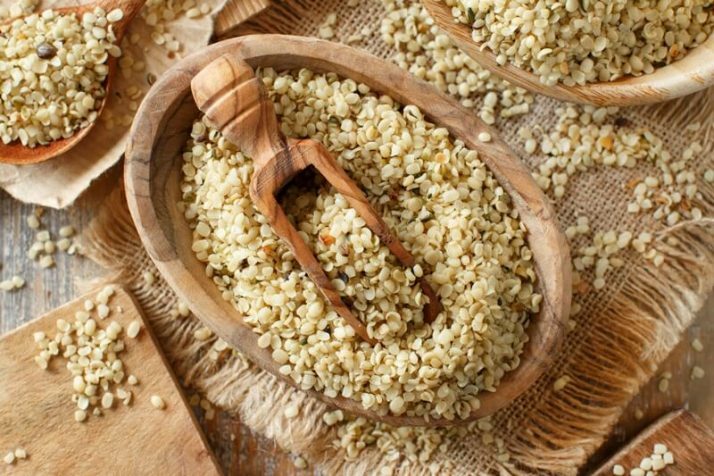 Coupled with its equally potent fiber, quinoa is no wonder one of the best fillers you can add to your green smoothies. 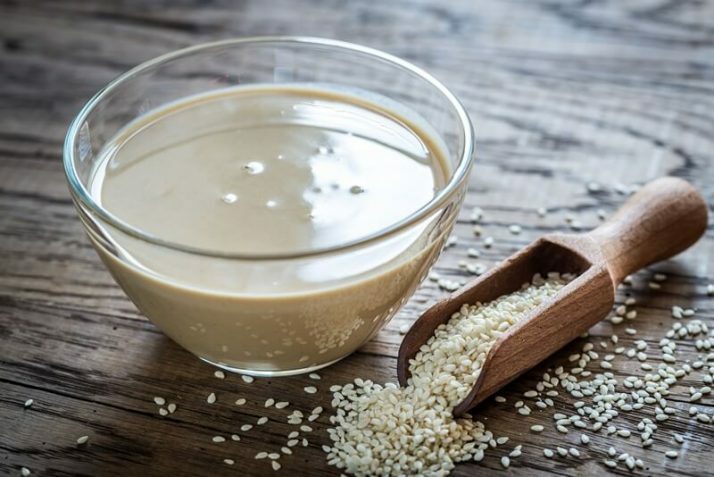 Quinoa can taste a little bit more bitter than oats when used in a smoothie. But it is possible to mask the flavor with a good recipe. 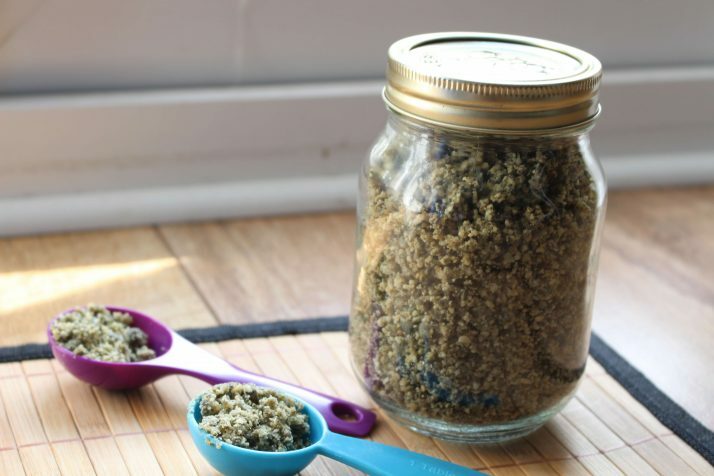 As quinoa is quite dry and dense, you might find that your smoothie is too thick after adding this to it. If that’s the case, simply add a small amount of water until it thins out the smoothie. Check out my quinoa smoothie recipe here which will also answer any questions you have about preparing quinoa for your smoothies. 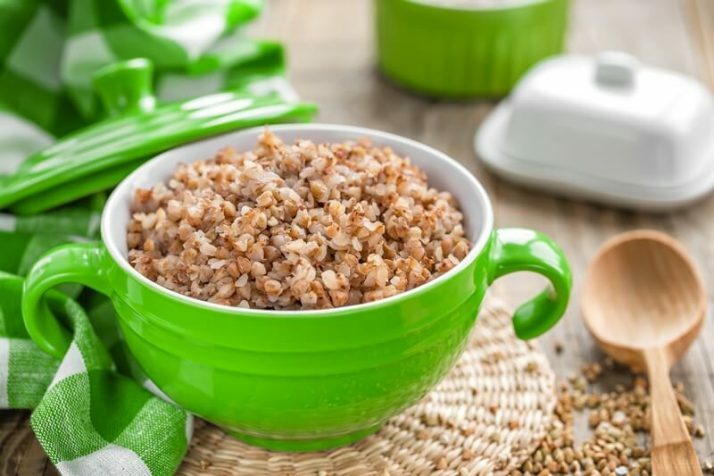 A recent study has concluded that buckwheat can aid in appetite suppression due to the fact that it has a high fiber content that promotes stomach fullness. Buckwheat, just like other whole grains, has one characteristic in common: fiber. This makes you feel fuller for longer. And despite the name, buckwheat doesn’t contain wheat and is actually gluten free. As buckwheat is quite dry and dense, you might find that your smoothie is too thick after adding this to it. If that’s the case, simply add a small amount of water until it thins out the smoothie. If you decide to include it to your green smoothies, you can enjoy a whole, filling meal. Check out my buckwheat smoothie recipe here which will also answer any questions you have about preparing buckwheat for your smoothies. If you’ve never heard of putting a sweet potato in your smoothie before, you might think this sounds a little bit weird. But believe me, the sweet potato is the perfect smoothie ingredient. Not only is it super sweet, but the texture is silky and creamy and divine in a smoothie. 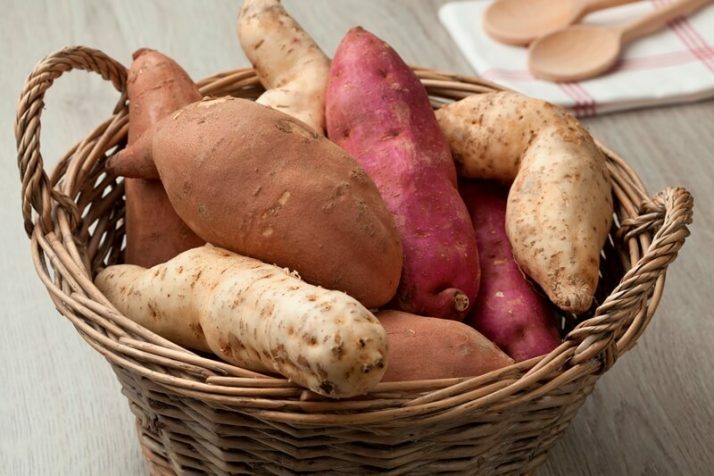 Almost all tubers possess a unique trait: being high in carbohydrate content. And as we know by now, carbs effectively contribute to prolonged satiation. This is why sweet potato or a white potato added to a green smoothie can help you suppress your appetite until the next meal. Check out my sweet potato smoothie recipe here which will also answer any questions you have about preparing sweet potatoes for your smoothies. Actually no. Beans are quite flavorless on their own. They tend to take on the flavor of the recipe that you put them in which is why most people add beans to spicy stews and dips. 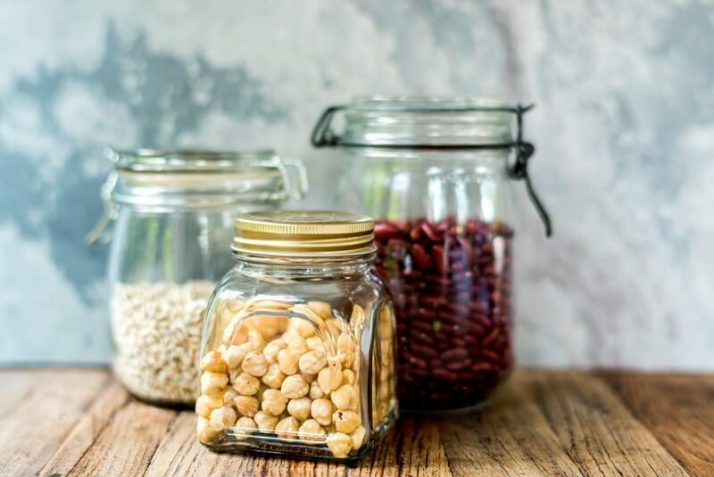 There’s a groundbreaking study that suggests legumes, particularly white beans and peas, can promote better satiation levels compared to meat. That’s good news, especially if you’re cutting back or abstaining from animal meat. If you add these white beans to your green smoothies, not only do they fill you up until your next meal, but they also provide a crazy amount of nutrients and protein. Did you know that beans are classified as both a protein source AND a vegetable? That’s because they’re the only food on the planet that contains the same nutrients as a vegetable but similar protein amounts to meat. ¾ cup of beans provides 13 grams of protein which is very high. Beans are actually my filler of choice now since I started doing weight training. I use to use a combination of both nuts for my protein and oats for my calories in my smoothies. But I since realized that I can get a lot more carbs and protein and nutrients in beans that I was getting in my nuts and oats. Beans are also much lower in fat than nuts which means you can include a lot more of them without adding too much fat to your diet. My results in the gym have gone through the roof since I started adding beans to my daily green smoothies. My favorite beans to use are edamame beans, but other good choices are white beans or black beans. Just make sure they are cooked first. As beans are quite dry and dense, you might find that your smoothie is too thick after adding this to it. If that’s the case, simply add a small amount of water until it thins out the smoothie. 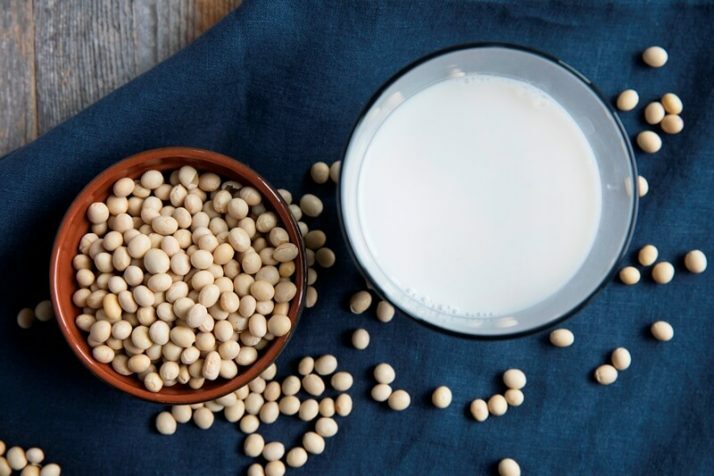 A recent study concluded that consumption of high protein soy foods was linked to appetite reduction which resulted in weight loss. 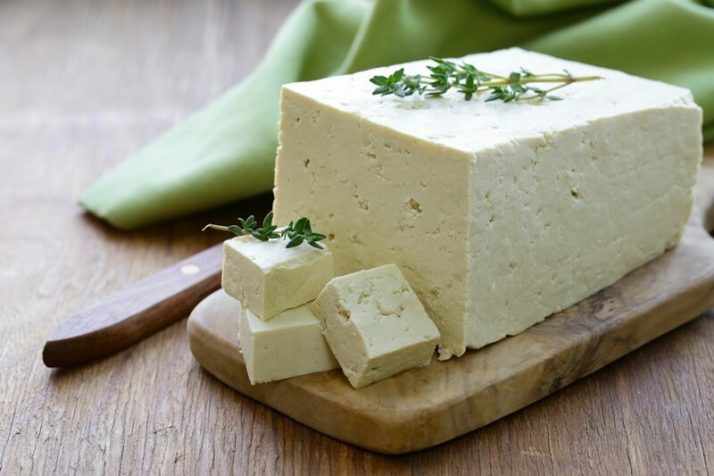 If you’re aiming to load on protein without suffering from hunger through abstaining from meat, you can always depend on tofu to give you the feeling of fullness. Adding tofu to make green smoothies more filling has been a fun invention of mine, and I’m glad to share this discovery with you. I added tofu to my green smoothies for about half a year before I realized that whole beans were much lower in fat and had more nutrients, so I switched to beans instead. Tofu makes a smoothie nice and creamy. 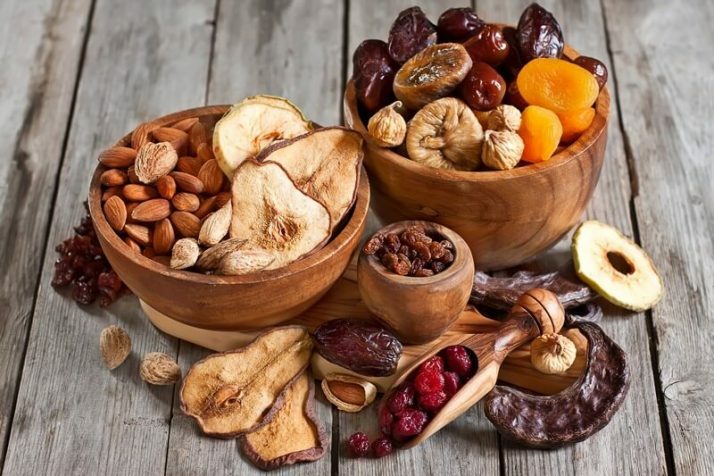 Dates, raisins and other similarly dried fruits speed up your metabolism, according to many clinical studies. Not only will they add flavor to your green smoothies, but they can also give you an edge in your weight loss journey. If you have a sweet tooth, or your kids do, this might be a good option for you. As dried fruit is quite dry and dense, you might find that your smoothie is too thick after adding this to it. If that’s the case, simply add a small amount of water until it thins out the smoothie. Improved appetite control is just one of the health benefits you can experience from drinking soy yogurt. 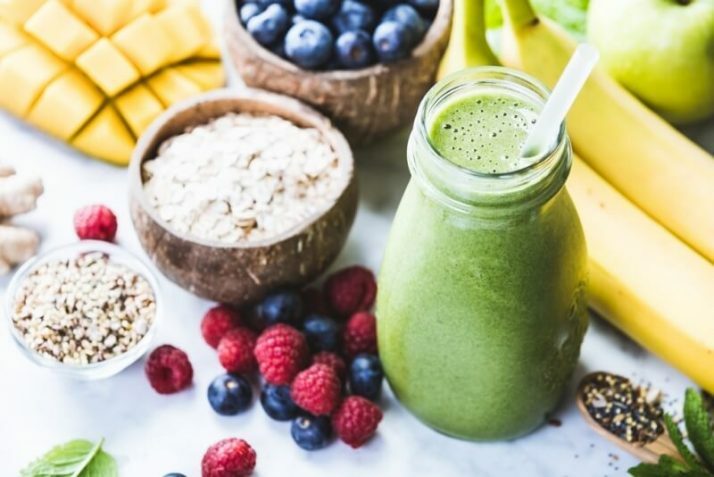 If added to your green smoothies, you can take advantage of its filling taste which will help you cut down on calorie intake from actual plated meals. The digestive enzymes will also help you to improve your digestion. As yogurt is mainly just a liquid, your smoothie size will increase by 1 cup by adding this filler to it. This is my own DIY meal replacement powder which takes the hassle out of preparing your fillers for green smoothies. It is made of ingredients that are healthy, organically-sourced, unprocessed—and yes, so filling! To use, all you have to do is pour out the contents into your blender and blend with the rest of your smoothie ingredients. It is basically consists of filler base and flavor powders, which give your green smoothie its awesome taste. As my meal replacement powder is quite dry and dense, you might find that your smoothie is too thick after adding this to it. If that’s the case, simply add a small amount of water until it thins out the smoothie. To get my easy recipe for my homemade meal replacement powder, click here. Now that you know how to make your smoothie more filling, you’ll be needing a delicious recipe where you can put this into action. This banana and peanut butter smoothie is one of the most popular recipes on my blog. This recipe serves 2 so you need to add 2 quantities of fillers to it and drink one for breakfast and one for lunch to see fast results. Learning how to make green smoothies more filling is a skill you must develop in order for you to stay the course with the green smoothie diet. You can always refer to my suggested smoothie fillers in the future so you can replace your whole meal with a green smoothie. After all, staying full is what we need to aim for if we want to curb our appetite and lose weight. 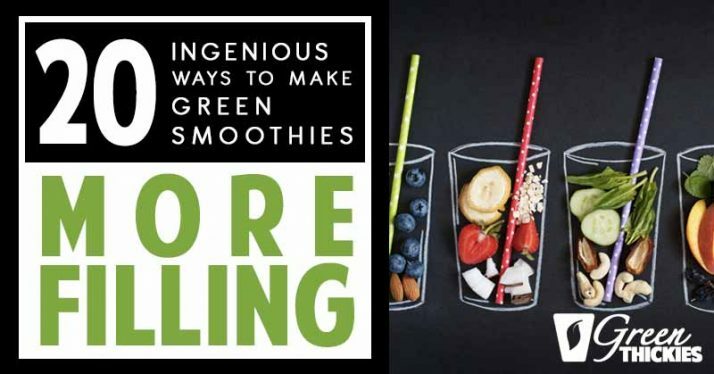 If you enjoyed this article, 20 Ingenious Ways To Make Green Smoothies More Filling please let me know your thoughts in the comments.